We have black men who have mastered the field of medicine, we have black men who have mastered other fields, but very seldom do we have black men in America who have mastered the knowledge of the history of the black man himself. We have among our people those who are experts in every field, but seldom can you find one among us who is an expert on the history of the black man. And because of his lack of knowledge concerning the history of the black man, no matter how much he excels in the other sciences, he's always confined, he's always relegated to the same low rung of the ladder that the dumbest of our people are relegated to. El-Hajj Malik Shabazz, (Malcolm X), "Black Man's History"
The same map appears on the inside back and front covers and again on the second page of chapter one. Eyes traveling from left to right, there is the familiar shape of South America lying next to the waters of the Atlantic Ocean, and then the lower western and southern coast of Africa on the right. Travel routes, ship routes, to be exact, designated by lines and arrows, run from Bonny Island to the south of Senegal on to Rio de Janeiro. Sailing south of Rio de Janiero, ships arrive at a port in Montevideo. There is a single line connecting Montevideo to the tip of South America. This single line from Montevideo to Rio de Janiero will make trade in commodities global. It was a daring decision to push on, beyond the limits, for one seafaring captain. Courageous some would say. Months of harsh seas and indifferent winds. Months, too, for some, of indignation. Hundreds of thousands of tons of cargo traveled up and down these routes. In fact, if we just leave it at that--just leave it at tons of sugar and rum, clothes, tons of spices, oranges, then the maps would tell the story of trade, the exchange of goods, between Africa and South America. Maybe the folks at Metropolitan Books, Henry, Holt and Company, thought the maps sufficient to explain the whole story, but readers of Greg Grandin's The Empire of Necessity: Slavery, Freedom, and Deception in the New World would soon know (just take a guess by looking at the title of the book) that these lines on the map represented slave routes. In fact, this trade, this exchange of goods, had as its most profitable commodity or contraband--human beings. Africans. 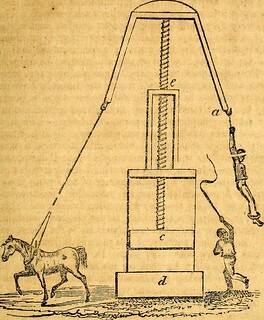 "Slaves were the flywheel on which the whole thing turned." But where are the real origins of these solid and dotted lines representing trade routes from Africa to South America? Would not the slave routes really begin in Europe--Spain, Portugal, France, England, and Holland? It was a global endeavor.